Puerto Rico is located on the sunny south west coast of Gran Canaria. The resort of Playa del Ingles is approximately 8 miles away and the distance to the airport is around 30 miles. Puerto Rico is built along and up the sides of a valley, where white walled apartments and villas fill the two hills. Puerto Rico has two main beaches, Puerto Rico Beach and the delightful Amadores Beach. Puerto Rico is also home to 2 harbours, from where you can take boat trips and excursions. The steep inclines in the resort mean that it is not really suitable for visitors with mobility problems. During your stay here take the pleasant stroll to the end of the beach here you will find a beach path and this connects to Amadores Beach and should take approximately 20 minutes. During this walk you can enjoy a beautiful view of the coast and on arrival at Amadores Beach you will see why it was worth the effort, you will be met by beautiful white, Caribbean style fine sand, here you can laze and relax alongside other sun worshipers from all over the world. 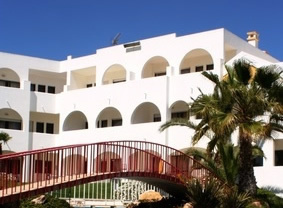 The resort itself has got all the necessary services you could possibly require including: taxis, buses, supermarkets, shops, hairdressers and beauticians, internet cafes, restaurants, bars, clubs, and a water park. Puerto Rico's nightlife is located in the centre of the town, this is a pedestrianized area dedicated to every variety of nightlife, so whether you are in search of a relaxing meal and a few drinks or a loud pulsating nightclub to keep you dancing until the morning you will find it here. If you enjoy dining out Puerto rico provides something for all budgets, there are restaurants to suit your taste and your wallet, everything from traditional Canarian to international cuisine is on offer, so all you have to do is make your choice. As with the rest of the Canaries much of the shopping is focused on clothing, duty free and souvenirs, and if that is the type of thing you are looking for then it will not be hard to find in Puerto Rico, the shops are mixed amongst the bars and restaurants, for the real shopaholics a trip to the resort's shopping centre here is a must. If you have time between the pool or beach and the vibrant nightlife there are a number of other activities within Puerto Rico for you to enjoy. They range from boat trips and water sports to golf. The boat trips include dolphin and whale watching, there are also ferries that go from here that visit other resorts, and if you like fishing there are numerous fishing trips, most boats provide fishing equipment and some also provide food & drink in the price.